The PSUK (Police Sport UK) Squash & Racketball Championships 2019 took place over the weekend of April 5-7th at the Hallamshire Club, Sheffield. Competitors from all over the UK represented Police Officers, retired Police Officers, Police Staff and connected partner agencies in 5 categories of competition in Squash and Racketball. The 8th annual Racketball Open Championships involved players from Scotland and Wales and from England players from Sussex to Cornwall and London to Leicestershire all took part, with all having had to previously qualify through regional competition. The weekend produced a feast of Racketball and featured many tight encounters. The early group stages were gruelling. Barry Oldroyd-Jones unseating Damien Boyle (3) 3-0 to progress into the final pool being the stand out result of the early group stages. The other groups went according to seeding. The group stage runners-up entered the Plate pool. This proved an interesting competition and on any other day the results could have reversed but it was Boyle who managed to find some form in the final game against Graham Jones who started to wilt after rushing into a 2-0 lead, Boyle running out 3-2 winner and PSUK Plate Champion 2019. 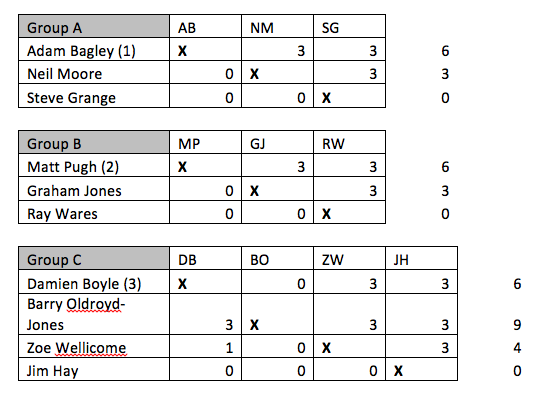 The main draw saw Oldroyd-Jones finally run out of steam against Adam Bagley (1) and Matt Pugh (2) falling short 0-3 in both games which meant the final pool match would be a winner take all encounter. In a brutal match that swung one way and then the next it was Pugh who was left disappointed unable to convert a match ball in the 4th. 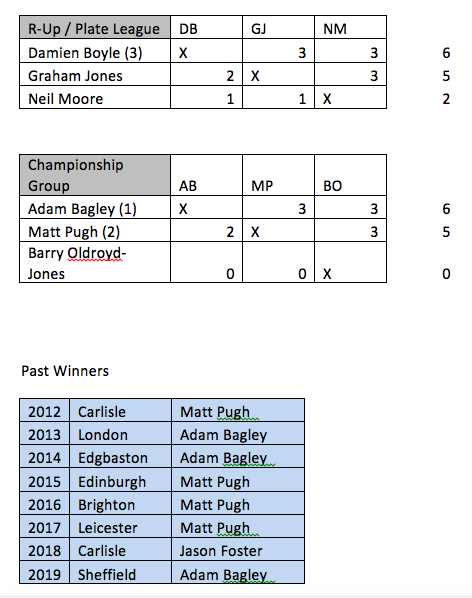 Bagley taking the 5th 11-9 to become PSUK Champion 2019.